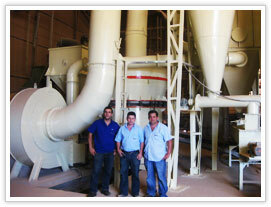 Grinding mill line with trapezium grinding mill, Ultrafine mill, elevator, dust collector. Rita Chekmeneva from Russia Aquaphor Corp. bought SBM grinding mill to produce active carbon to use in their water filters. Aquaphor® is the one of the largest home water filter manufacturers with more than 800 full-time employees. Aquaphor® manufacturing facilities include state-of-the-art production of fibrous adsorbents, carbon blocks, plastic moulding and filter assembly. The Aquaphor® Research Department includes chemical, microbiological, mechanical, automation and design laboratories. While Aquaphor® was looking for a supplier of a complete line (turn-key project) to grind and sieve active carbon, SBM was selling its newly-design grinding equipments oversea. Aquaphor Corp. needed various size of final active carbon which is hard for some grinding mills: mesh 50*100; 100*200; 200*400 and dust. SBM designed a complete active carbon line for the Aquaphor Corp. and they happily bought our grinding mills. Finally, it is proven that our grinding equipments are fit for precise size requirement. SBM design this grining mill line with MTW trapezium grinding mill, Ultrafine series grinding mill, elevator and bag-type dust collector which were acceptable by our customer.